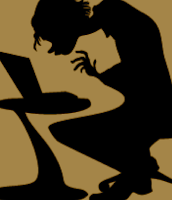 A Year of Being Here: Roger Keyes: "Hokusai Says"
"Hokusai Says" by Roger Keyes. Text as posted on Joan Spear's Authentic Adventure (7/12/2010). No bibliographic information available. If you have source information, please share. Curator's note: From what I can gather, the poet Roger Keyes is an American professor of East Asian studies. This poem is apparently his cross-media translation of the art of Katsushika Hokusai (1760-1849) into poetry. 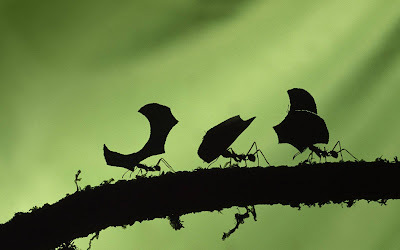 Art credit: Untitled image of cutter ants at work, in silhouette, by unknown photographer. This is so awesome. It touched my heart and reminded me of my need to stay present and welcome all of life. Roger Keyes is American author, specializing in Japanese prints, especially Hokusai. He is featured in the British Museum film about Hokusai for their 2017 exhibit. He is awesome.